Most animals do feel happiness and to some extent sadness. On the other hand, mammals, specially the ones who are domesticated feel a lot of similar emotions to humans. They feel joy, love, grief, excitement and even depression. Dogs can suffer depression. Doggie depression is characterized by loss of energy, change in temperament and lack of appetite. Dogs can be depressed due to a number of things. Life situations, change in location, the loss of a friend, quarreling in the home and many others can trigger depression in dogs. Although there are not a lot of studies regarding dogs suffering from depression, this cases do exist. Depression can be caused by physical or psychological issues. Usually in physical issues, the dog feels sad because he is sick or feels too much pain. Physical issues – Dogs who have severe illnesses or severe pain can suffer the most. Dogs with cancer, tooth and gum problems, kidney and bladder problems can be withdrawn and feel unattached. Psychological issues – On the other there are also that suffer from thoughts that cripple them from living well. Dogs who have been rescued from a shelter can be traumatized. Also if a dog’s friend or companion dog dies, he or she will or may suffer from depression. Another issue is when the dog is always told off, he or she may construe this as disapproval from his owner and may become depressed. Having a new dog can make him also feel jealous. Another issue is if you moved to a new place and he finds this place too scary. Dogs may show various symptoms when they are depressed. They revert from being happy and active to sad and withdrawn. 1. Loss of Appetite – Dogs tend to eat less when they are unhappy. Dogs normally relate food to feelings of fulfillment and joy. When they are sad, they may lose interest in food. 2. Being withdrawn – Your once happy and bouncing dog may suddenly be drifting apart from you. He or she may lack the energy to play or go for walks. 3. Becoming lethargic and sleeping all the time – A depressed dog usually does not want to do anything else besides sleep and be quiet. He or she will not want to engage with other dogs or humans. 4. Becoming easily agitate or angry – Some dogs express their pain and sadness through aggression. They will bark a lot and try to destroy things. They will bite shoes and destroy furniture. Dogs like this may also try to attack other dogs or humans. 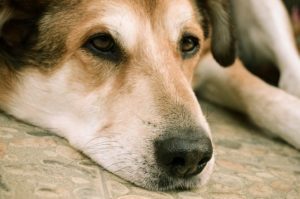 Doggie depression’s symptoms are normally associated with other ailments so it is best to consult a vet to rule them out. Issues such as dental decay or kidney problems or even tick and flea issues can lead to these symptoms so it is best to know what is truly bothering your dog. Once you have found out what is causing his issues and found that it is not something physical, you need to engage your dog and make time for him. You need to treat him like a wounded child. He or she needs your love and support. 1. Giving him enough play time – try to lead your dog and show him that he can still have fun. 2. If you have moved to a new place, try to let him warm up to this area. 3. If you have a new dog, make sure that you show that you still love the former dog as much as the new one. 4. Try giving him doggy treats and giving him delicious food. 5. Make sure he is getting enough exercise – not enough exercise can lead to frustration and temperament issues. With proper love and support, your dog can regain his happiness and energy. He can be active until he grows old.